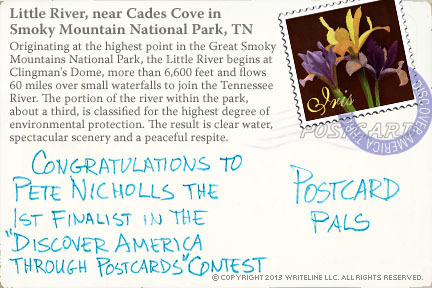 Here's the First Finalist in the 10th Annual "Discover America Through Postcards" Photo Contest. 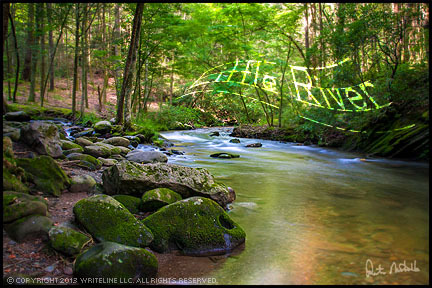 Originating at the highest point in the Great Smoky Mountains National Park, the Little River begins at Clingman's Dome, more than 6,600 feet and flows 60 miles over small waterfalls to join the Tennessee River. The portion of the river within the park, about a third, is classified for the highest degree of environmental protection. The result is clear water, spectacular scenery and a peaceful respite. If you haven't already entered, it's still not too late to submit one of your photos of any place in the Americas. The deadline is November 15, 2013, 8 PM, EST. Photos should inspire a viewer to want to learn more about, or travel to that place. See the official rules and entry form. In the coming weeks, three more finalists will be selected out of which you choose the winner. All finalist receive the companion book, Discover America Diaries, and the big winner also receives $100. We look forward to seeing your best shots.